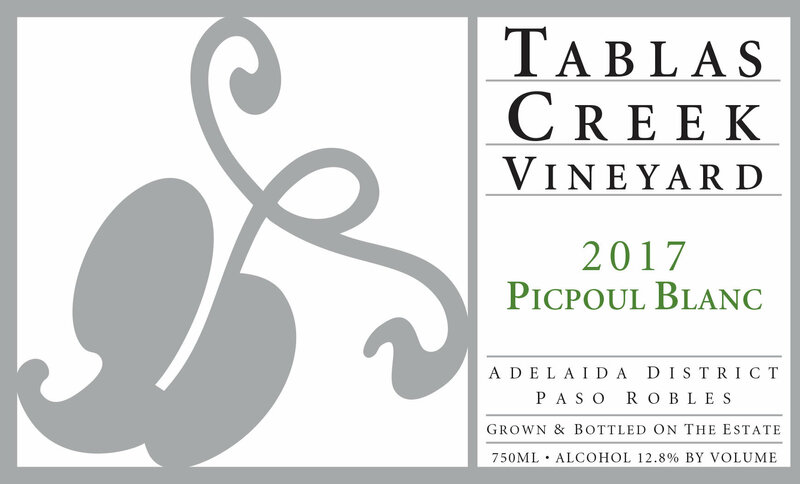 The 2017 Tablas Creek Vineyard Picpoul Blanc (also known as Piquepoul or Piquepoul Blanc in France) is Tablas Creek’s tenth bottling of this traditional Southern Rhône varietal, used in Châteauneuf du Pape as a blending component, and best known from the crisp light green wines of the Pinet Region in the Languedoc. Derived from the French "piquer" (to sting), in France the grape is known for its bright acidity, its minerality, and a clean lemony flavor. We have found that in California, it maintains its bright acidity, but also develops an appealing tropical lushness. The 2017 Picpoul Blanc is both bright and tropical on the nose, with aromas of fresh pineapple, wet rocks, gingersnap, and minty spice. The palate shows flavors of passion fruit, grilled pineapple, fresh coconut, sweet baking spices, and sea spray minerality. The acids build in the mouth and the wine finishes with lingering flavors of wet rocks and lemon zest. Drink now and over the next few years. Picpoul Blanc was the first supplementary varietal we brought into the country after the initial eight varietals. It went into quarantine in 1996, and was released in 1998. The first vines went into the ground in 2000. We were so pleased with the varietal that in the winter of 2005-2006 we tripled our planted acreage (from 1 to 3 acres). Our Picpoul grapes were grown on our certified organic estate vineyard. The Picpoul grapes were whole cluster pressed, and fermented using native yeasts in a mix of stainless steel and neutral 60-gallon oak barrels to achieve a balance of freshness and richness. It completed malolactic fermentation in barrel, and was bottled in June 2018.